Defo GT STS DH (possibly 98 ) I had the 97 one. 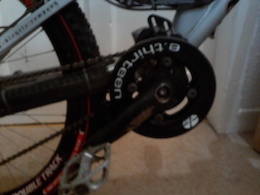 Same AC cranks/chain device and Azonic kit but they didn't come with Boxxers or discs. they came with a rockshox DHO (4" travel) and XTR V-Brakes. The 97 frame didn't even have disc mounts, it needed an aftermarket bolt on adapter to fit them. Frame above looks like it has disc mounts and no canti bosses on the seatstays. bout time I've been running a 250mm KS dropper for over a year on my Dartmoor 4X (14" seat tube). fully down it's the perfect height for jumping/4X etc.. fully up it's the perfect height for pedalling seated I use the bike for everything from 4X/Jumping/BMX/Pumptracks to XC to Enduro I'm 5'11" 33" inseam. I love the fact you didn't mention any "L" shaped motion BS and taught brakeless technique instead of rear brake drag .reliance. Way more stylish.